The Jeanneau 51 embodies harmonious luxury – with a dignified silhouette and spacious interior. The naturally beautiful and versatile yacht offers exceptional sailing and liveability. In the 4 cabins, space comfort and functionality are the stand out key features. 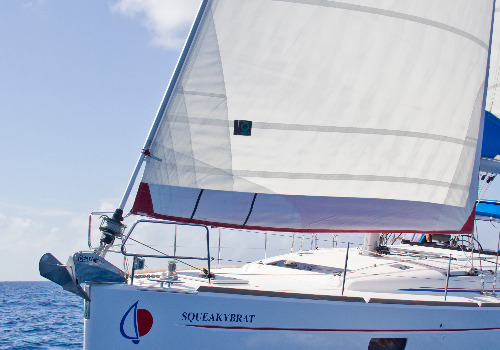 This is inspired by the successes of slightly smaller models, the Sunsail 51 is a true work of art. Jeanneau designed a modern and performance-oriented hull with a hard chine along with elegant and timelessly beautiful deck styling. Inside, the impressive volume and light provides an open and airy feeling. Attention to detail can be found throughout – especially in the safety, function and look of each detail. • Charters begin on Saturday (Kremik, Dubrovnik) or Sunday (Kremik). • Charters will begin at 6 pm with a sleep aboard the first evening and finish at 9 am on the final day of your charter. • Weekly rate (7 nights) is 6.5 times the daily rate. • Crew requires separate cabins. • Night Sailing is not permitted; you must be moored at least one hour before sunset at all of our locations. • 30% of charter fee is due upon booking. The outstanding balance is due 60 days prior to departure. • Any change in dates, destination or yacht type is a cancellation. * 90 days or more prior to departure: $400 penalty or reschedule and pay an administration fee. * 89 – 61 days prior to departure: loss of 30% deposit or reschedule dates with a $400 penalty. * Less than 60 days prior to departure: no refund and 100% of vacation balance due. * If any scheduled payment by Charterer has not been received by the payment due date, Sunsail Group reserves the right to cancel a charter retaining all deposits and fees paid to date. * All changes to bookings (date or type of boat) after confirmation will be subject to a $30 administration fee. • Travel and Cancellation insurance is available & highly recommended, please Click Here for details. • Please note, prices nor availability are guaranteed until payment has been received.